Epilobium angustifolium of Michigan Flora. Dry forests (aspen, jack pine, etc. 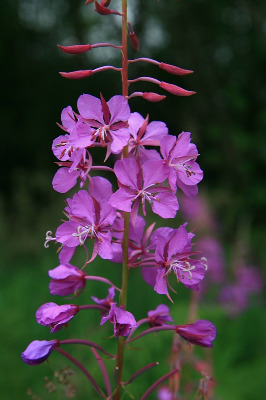 ), fields, roadsides, rocky ground; clearings and borders of forests, upper shores; gravel pits and other disturbed ground; frequently in rather wet places; as the common name suggests, thrives in burned-over areas, blooming in profusion as soon as three months after a spring fire. Rare white-flowered plants are at least as handsome as the normal pink ones and may be expected anywhere; they have been collected in Emmet, Marquette, and Keweenaw Cos.
Sennikov (2011) argues convincingly that Chamaenerion should be the correct genus, not Chamerion. MICHIGAN FLORA ONLINE. A. A. Reznicek, E. G. Voss, & B. S. Walters. February 2011. University of Michigan. Web. 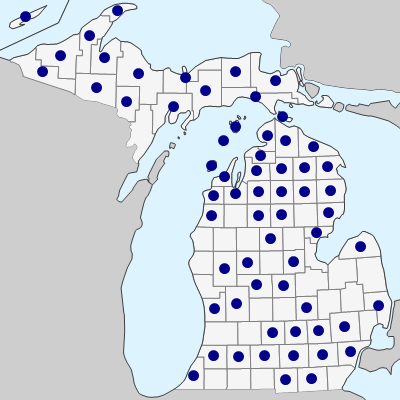 April 20, 2019. https://michiganflora.net/species.aspx?id=1744.